Resistant to low concentration acids and alkalis, disinfectants and manure. Anti-static, energy absorbing and insulated down to -4 Fahrenheit. 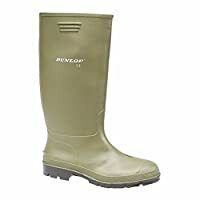 Practical knee boot from Dunlop. Ideal for use in agriculture, walking and leisure. Resistant to minerals, vegetable oils and fats. The original purofort boot with no steel parts and oil resistant outsole. Lightweight, comfortable and durable with a wide tread for different surfaces. Standard: EN ISO 20347:2012 O4 FO CI SRA. A practical and durable work boot for farm work. With no steel components and oil resistant outsole. Excellent resistance to various liquids and materials and a good life span. Ideal for less intensive and general tasks on the farm. Resistant to low concentrate acids and alkalis, disinfectants and manure. The Dunlop Blizzard Wellies are ideal for the winter months, designed with a fully waterproof outer, combined with a thick, fleece lining and padded collar offering excellent insulation in cold weather. For traction on icy and slippery surfaces, these Dunlop wellington boots also benefit from a robust rubber outsole with a multi-directional lugs providing good grip. Padded collar with drawstring tie. Suitable for general leisure activities. 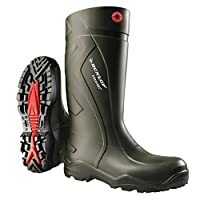 Ideal for muddy walks, river paddling and wet weather. 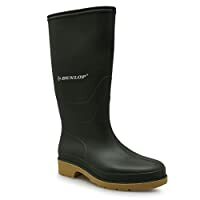 Practical calf length boot from Dunlop. Ideal for use in agriculture, walking, hunting and leisure. CE Rating, EU consumer safety requirements. Dunlop Pricemastor x Size 3 (36). Easy clean, nylon lining, resistant to low concentrate acids and alkalis, disinfectants and manure. Green with black sole. From one of the most respected names in wellies these boots will keep your feet dry. They are made from tough PVC and are even resistant to low concentration acids, alkalis and disinfectants. With a durable upper and crepe sole these practical and hardwearing boots will not let you down. Keep your childs feet warm in these 100% waterproof boots. Will keep your feet dry. Made from tough PVC and are even resistant to low concentration acids, alkalis and disinfectants. With a durable upper and crepe sole. Dunlop Pricemastor x Size 5 (38). Easy clean, nylon lining, resistant to low concentrate acids and alkalis, disinfectants and manure. Green with black sole. 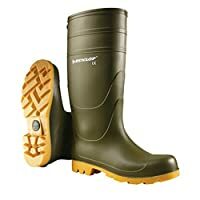 Green Dunlop Rubber wellington boots. Gold Dunlop logo on side. Dunlop Pricemastor x Size 4 (37). Easy clean, nylon lining, resistant to low concentrate acids and alkalis, disinfectants and manure. Green with black sole.